You may have been dreaming of a casual wedding your entire life, but we'd guess even the most laid-back brides sometimes wonder what they'd wear down the aisle on the off-chance they won the lottery. Well, we found the answer. 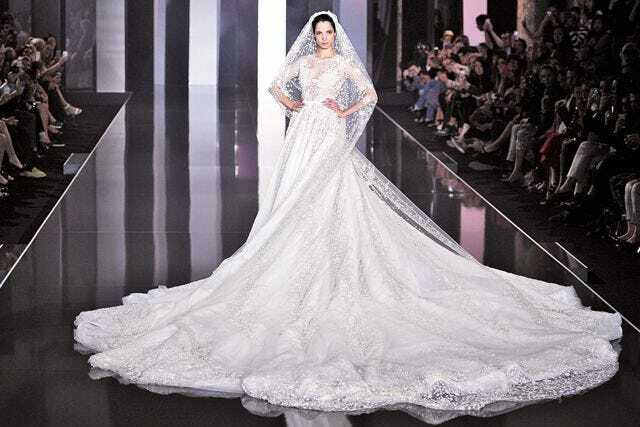 This impossibly stunning Ralph & Russo dress, which took more than 3,900 hours (more than five months' worth!) of hand embroidery, required 40 different types of beads and 25 types of Swarovski crystal, Vogue reports. "In couture, the bride is such an important look," designer Tamara Ralph told the magazine. "Obviously, it's the closing piece, so there's a lot of emphasis on it — and it's always one of the most in-demand pieces with clients."